What an experience this has been! It is my second time to be in the Dominican Republic and it wonÂ´t be my lastâ€¦ I have thoroughly enjoyed my experience here while studying in Santo Domingo, the capital. After over two months it is hard to sum up an experience like this.Â Â One of my favorite things here in this country is the people and their rich heritage. The Dominican RepublicÂ´s national language is Spanish and the people are a mixture of 3 different groups; Africans, Spanish, and Natives. The island of Hispaniola was originally named Â â€œQuisqueyaâ€ by the natives because it really is a beautiful land. Across the island, which is about the size of Pennsylvania and Maine together,Â there are mountains, valleys, deserts, farmlands, busy cities, and of course beautiful beaches. I am currently studying at PUCMM one of the best universities in the country. I have Spanish classes every day and I am continuing to improve my language skills. Every day we discuss current events in my class which has helped me understand the people, culture, and even the business world here.Â The people here are some of the most outgoing and friendliest I have ever seen. Â Of course, being a blonde American in a country where I never see other White people can cause some men here to be a little TOO friendlyâ€¦ LetÂ´s just say IÂ´m very cautious every where I go! Overall though, it is a great place to meet people and have a great time. The culture here seems to revolve around â€œhaving a great timeâ€.Â The food here is so delicious, especially if you enjoy eating rice, and I will greatly miss it once I return to the states. Also, people here love to dance and since Merengue originated from the Dominican Republic, every where you go at night you will most likely find people dancing. I love it! While learning about the people and experiencing the culture I have learned how these greatly affect the business world here. I must say that working at my internship here has made me miss the efficiency and standards of the business world in the US. Because the Dominican Republic is a developing country there are many difficulties for businesses here, especially corruption. Granted, there is corruption in every country but here it is very evident, Â out in the open and leaves people in a very helpless positions many times. I work without pay for a rural school in a small city outside of the capital, Haina. The people of Haina are very poor and do not have many options in life. My main job at â€œEl ColibrÃ­â€, the school, is to raise funds. This has been a difficult task. Even though working in the business environment here has been a little frustrating, I have learned many skills I will be utilizing in the future.Â It has also exposed me to the hardships of working for a non-for â€“profit organization. Even though it is difficult I enjoy the challenge and the knowledge that I am working for such a great cause. The Dominican Republic is such a beautiful country and I would be remised if I didnÂ´t include some pictures of my excursions here. They have ranged from white water rafting in the mountains, to horseback riding to a waterfall, and escaping to all-inclusive resorts on the most beautiful beaches in the world. I have truly enjoyed this aspect of my time here as well. Overall, this has been a wonderful experience and I will be enjoying these last weeks until my return to the States. 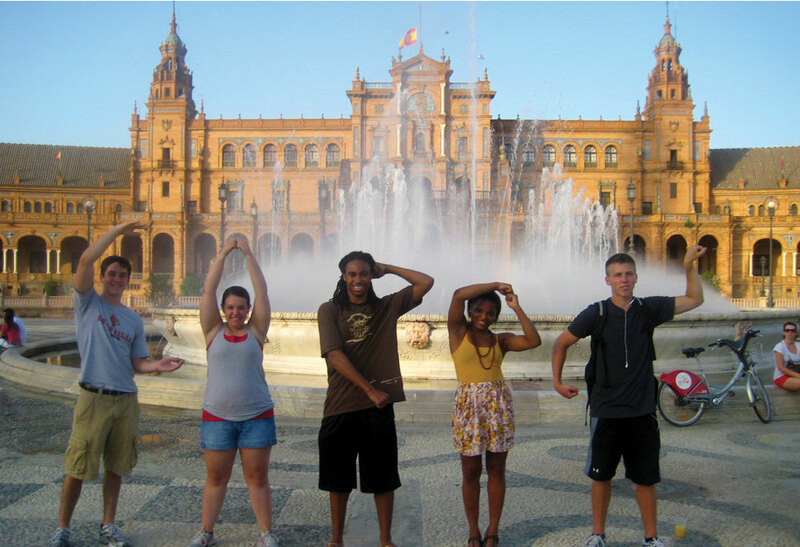 This entry was posted in Study Abroad, Uncategorized by Rachel Wooten. Bookmark the permalink.